Watch them and their excellent teeth now! Last night’s TV lineup turned out majestic pop-rockers, reunited Southern rappers, and snotty Swedish garage-rockers. Progress, right? It wasn’t actually as varied as that might sound, but we’ll break it down for you. 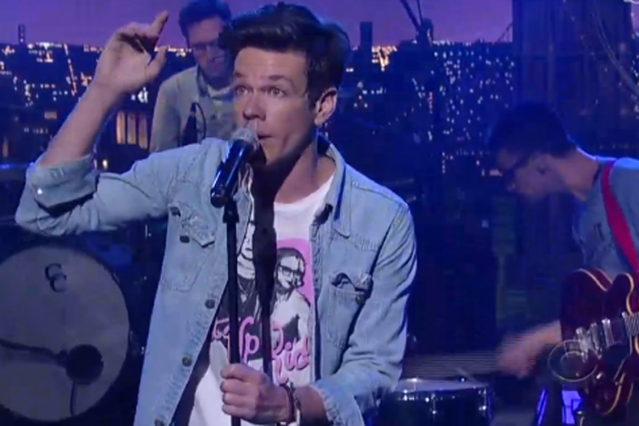 New York’s fun., led by Nate Ruess of Arizona cult faves the Format, stopped by Late Show With David Letterman for an expectedly bombastic rendition of chart-topper “We Are Young,”, though when we weren’t lamenting the absence of that song’s featured guest Janelle Monáe we couldn’t help but marvel at Ruess’s impossibly pearly whites. Letterman approved (via the Audio Perv). Last but not least, the Hives brought their matching formal-wear finery to Jimmy Kimmel Live!. Frontman Howlin’ Pelle Almqvist manically strolled the stage as the top-hatted Swedes powered through two unabashed party-rockers from upcoming their June 4 album Lex Hives. The glam-boogieing “Go Right Ahead” we’ve heard, but “Wait a Minute,” which might break its predecessor’s record for repetitions of an otherwise-forgettable title phrase in a three-minute span, is new. Happily, we didn’t notice the band members’ teeth, which at least in this performance failed to outshine the music.